Next up at bat in our series on applying persuasion principles to email marketing and design is the powerful duo, commitment and consistency, which happens to be the second principle within Dr. Cialdini’s 6 Principles of Persuasion. When executed successfully, this combination will help you move one step closer to achieving a persuasive email marketing campaigns—something that can only be accomplished by implementing these principles. If you haven’t read the previous article within this series and want more context on the six persuasion principles, we recommend beginning at article one. Once we make a decision or take a stand, we are likely to make future decisions to match that past behavior. Follow along as we cover, in detail, what this principle means for you and your email campaigns. Nobody wants to admit that they’re wrong, that they’ve misspent their money, or that they’ve made a mistake. This is why the principle of commitment and consistency is so effective. Once a user makes a decision or takes an action, they’re much more likely and much more driven to have their future actions remain consistent with their initial decision. This principle works well because users have an innate obsessive desire to be, and to appear to be, consistent with their prior commitments. It has to do with personal, interpersonal, and psychological influences rooted deep within psychology. There’s great proof and research that supports the principle of commitment and consistency. Here, we’ll cover just a few of the many examples including the racetrack study and the New York City beach crime study. The racetrack study was an academic study performed by a pair of Canadian psychologists. The study took place at the racetrack where the psychologists observed several individuals placing bets on horses. What they found was surprising. They observed the following: individuals would randomly select a horse to place a bet on. At the time of placing their bet, the observed individuals knew nothing about their selected horse. Yet, just after the bet was placed, they noted that the individuals felt much more confident in their selected horse’s chances of winning than they were immediately before the bet was placed. This is surprising because all other variables remained constant—it was the same horse, the same horse owner, the same track, and the same field. The only thing that changed was the individual’s perspective, as they now believed their chances of winning increased drastically. Why did the individuals feel significantly more confident after the bet was placed? The Canadian psychologists concluded that this is because we, as humans, are designed to remain consistent with our prior commitments. The New York City beach crime study was conducted by psychologist Thomas Moriarty. Moriarty conducted the study to prove that individuals are psychologically driven to remain consistent with their previous actions. But beyond that he also wanted to prove that, within certain scenarios, this psychological influence drives individuals to act in ways that are clearly contrary to their own best interest. To prove these claims, Moriarty ran a study in which he staged thefts on a beach in New York City. He wanted to see if bystanders would risk being harmed to stop the crime. Within these scenarios, one accomplice would set their blanket down on the beach next to an individual, which is the experimental subject. The accomplice would then take a stroll, leaving the blanket, a radio, and a few other belongings. During this time, another accomplice would pose as the thief. They would run past the now vacant blanket and take off with the radio. In these scenarios, the experimental subjects, or the bystanders, were reluctant to stop the thief. In fact, only four out of 20 observed individuals tried to stop the crime from taking place. Then Thomas Moriarty ran the experiment again. Except this time, he put a spin on the mocked-up crime scene. He had the first accomplice, the one who lounged on the blanket, ask the bystander if they would watch their things before they went on a stroll. The bystander would agree. After this request was accepted by the experimental subject, the results of the study changed drastically. After the accomplice asked the bystander to watch their things, the other accomplice would come by and stage the theft. Yet this time, 19 out of 20 individuals tried to stop the crime from taking place. The bystanders put themselves in danger because they were propelled by the psychological influence of consistency. Because they previously agreed to watch the accomplice’s things, they were driven to act in a consistent manner later down the road—proving that commitment and consistency is powerful enough to cause individuals to act in ways that are typically out of the norm for them. Now that we’ve discussed what commitment and consistency is and how it’s been proven true over the years, let’s move onto the support. Here, we’ll cover how to apply and identify this principle within email campaigns. The first email we’d like to use as an example was sent out by a company called Marketo. Most likely, if you’ve ever touched a marketing automation project, you’re familiar with this company. 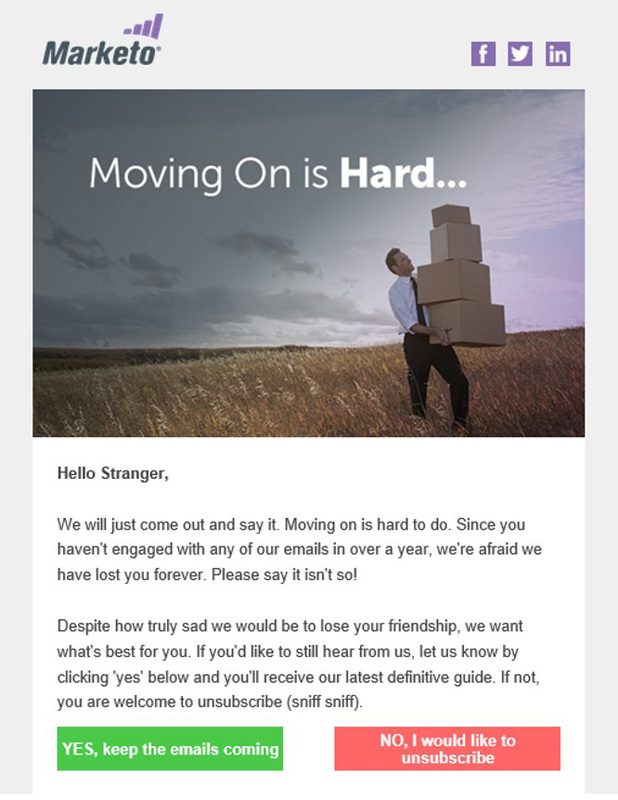 The example below is of an email that’s sent after a user hasn’t engaged with Marketo emails in over a year. It’s designed to elicit a response from the user. At its core, the email is a basic list cleaning email. However, after taking the time to look at it strategically, it’s much more than this. This is because Marketo used the principle of commitment and consistency in order to leverage their email campaign. Users experience this tug only when they’ve previously declared, said, and clicked “YES.” This is true because we know that when the user previously commits, they’re more likely to behave in a similar fashion the next time around. This claim is the beauty and the power behind the principle of commitment and consistency and is why this particular email is so effective. The next example we have for commitment and consistency is from REI, a company that sells products for a wide range of outdoor and fitness activities. In the previous example, the company was trying to cling on to a long-term relationship that seemed to be dwindling. However, in this example, REI is welcoming a user for signing up. They’re striving to begin a new, fresh, and hopefully long-lasting relationship. 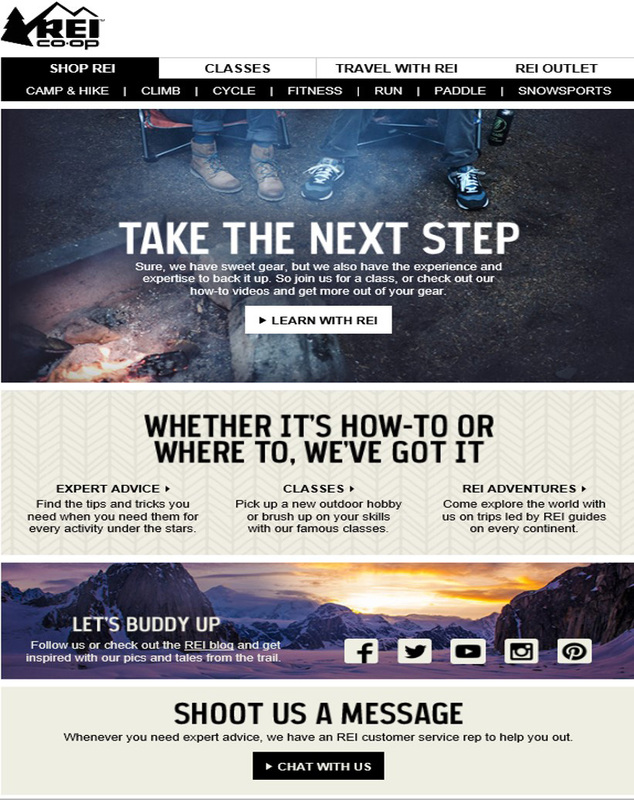 Welcome emails, like this REI example, are sent all the time by a wide range of companies. In fact, they’re so popular that you probably have a handful of similar emails sitting in your inbox right now. However, have you ever stopped to think why so many companies partake in these campaigns? Are they even effective? This change in perspective will help you transform what could be a rudimentary welcome email into an incredibly persuasive email campaign. Our last example of commitment and consistency within email campaigns is done by InVision, a prototyping, collaboration, and workflow platform. 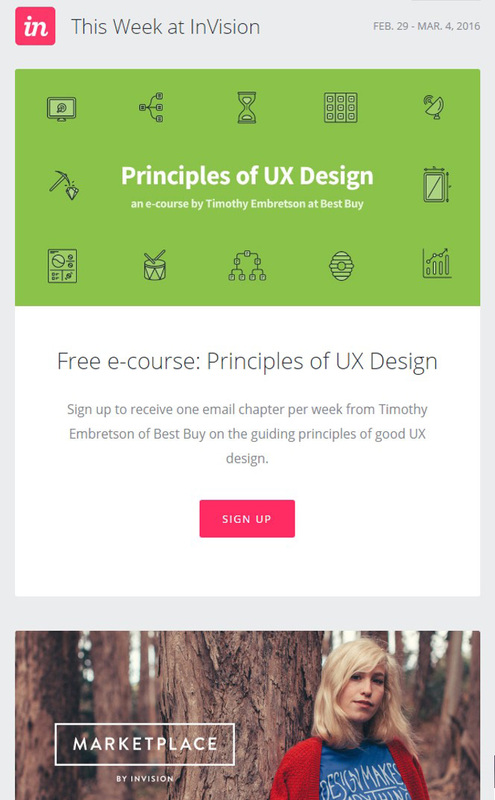 This particular email was sent out to encourage users to take advantage of a free e-course on the principles of UX design. By offering a free online class, InVision is trying to accomplish several things. First is the most obvious. This email was sent out to drive users to take InVision’s class. But more than that, this email also uses the principle of commitment and consistency—knowing that once the user tries the online course, they’re likely to remain consistent and engage with InVision in the future. Although this email was well executed, InVision could have taken the idea of commitment and consistency one step further by thinking in terms of “little steps.” For example, imagine that instead of requesting the user commits to the full course right away, that InVision initially utilized smaller, micro-steps. To accomplish this, they could have shown a quick video to summarize the course within 60 seconds or provided a short, downloadable PDF explaining what to expect. By providing a short video or PFD, InVision would work to captivate their users at a micro-level. The thought process behind this is simple. Once the user engages with a small request, they’re more likely to engage with a larger request in the future because they’ve previously committed. Micro-steps allow the user to warm up to your company and feel comfortable interacting with your resources, services, and products. Take a step back and think about the main action you’d like your users to take. From there, take a few more steps backwards and land on a smaller request that’s easy for your users to initially commit to. Progressively introduce a few larger actions until you reach the initial main action you’d like your users to take. By the time you get to that final step, users will already be comfortable, excited, engaged, and most importantly, committed to your company. When applying commitment and consistency to email design, think about what type of commitment you can get your users to take. Be sure to think, test, measure, and then implement relevant ways to engage your users quickly and efficiently. Remember, once your users commit, consistency will follow so be sure to remain persistent and create dialogue with the user shortly after their first commitment. Taking a step back, this article focused on the principle of commitment and consistency. Within the next article, you’ll learn about the power behind the third principle of persuasion, social proof.